Danny Etling is still LSU’s No. 1 quarterback. He’ll start against Syracuse on Saturday and probably Sept. 30 against Troy. There probably will be a “but …” behind Etling’s status as the starter until the season ends or freshman Myles Brennan supplants him. There’s no guarantee that Brennan will overtake Etling, but Brennan is very much in the picture going forward. Even more so after the Tigers were pushed around in Saturday’s 37-7 loss at Mississippi State. Neither the loss nor the margin was Etling’s fault. In fact LSU coach Ed Orgeron never even removed Etling from the debacle. “It never came up that Danny was playing that bad that we need to put Myles in,” Orgeron said. The first two games went in a manner that was conducive to Brennan playing. Etling was extremely efficient as the Tigers built big leads and Orgeron felt comfortable putting in Brennan to finish the thumpings of BYU and Chattanooga. Against BYU, Brennan completed his only pass for 12 yards. Against Chattanooga he completed 1-of-4 for 5 yards and ran twice for 7 yards. He got his feet wet, but hardly had an opportunity to demonstrate whether he’s ready to play in an SEC game. The game against Mississippi State got out of hand in the third quarter as the Tigers were beaten on both lines of scrimmage and the Bulldogs rushed for nearly 300 yards. The offense surely could have used a lift, but there was little reason to believe a change at quarterback was likely to provide one. “Those guys were on fire,” Orgeron said of the Bulldogs. Etling’s statistics weren’t good — 13-for-29 for 137 yards — but he wasn’t terrible. The running game wasn’t as effective as it was in the first two games so the play-action game wasn’t as good. 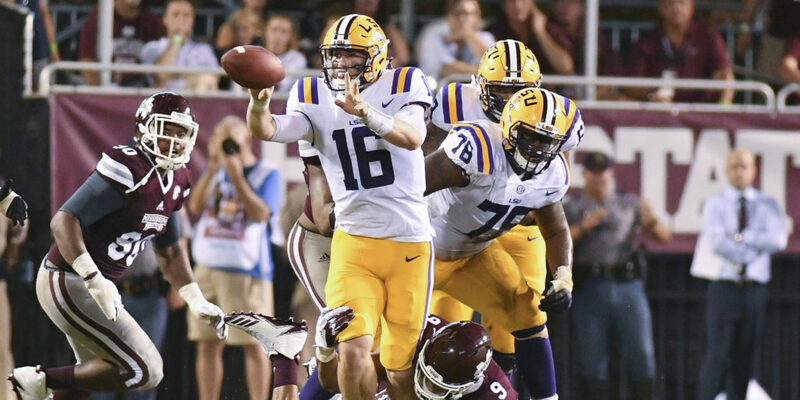 State consistently pressured Etling, the Tigers hurt themselves with crippling penalties and the receivers dropped a couple of dropped passes in spots when a big play might have provided a much-needed lift. “I think it falls on the quarterback,” Orgeron said. The head coach and offensive coordinator Matt Canada reviewed the decision-making at the line of scrimmage. So Brennan is getting more reps in practice this week and there’s every reason to believe he will get snaps in the game this week, possibly the most he has gotten to date. Whether a true freshman is going to be a better decision-maker than a fifth-year senior under game conditions is questionable. But Etling has always been limited and Brennan gave him a run for his money in preseason camp because Brennan has a much higher ceiling and is the heir apparent. After three games LSU is ranked 105th in the FBS with 184 passing yards per game -- nearly identical to 2016 (101st, 190.1 yards a game) and 2015 (105th, 180.4). Brennan’s ascension to the starting position has always been a question of timing. Would Etling play well enough that Brennan’s ascension would have to wait until his sophomore season? Or would Brennan’s talent, and the temptation to accelerate the development of the player most likely to be the most important player on the team for the next two or three years, shorten Brennan’s wait? 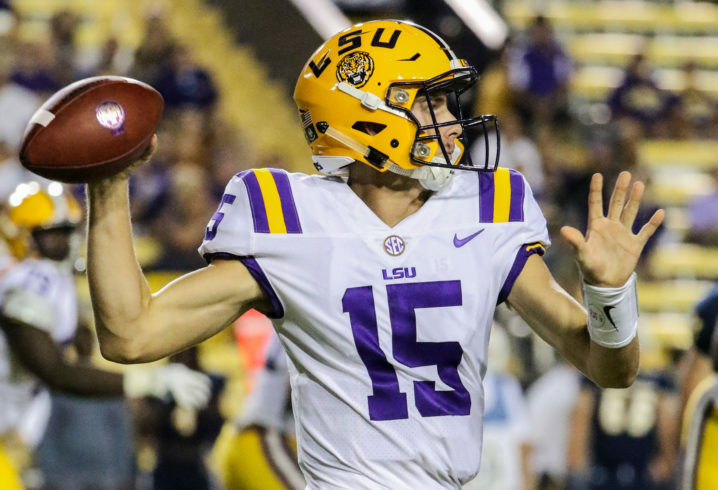 Orgeron made the sensible choice when he named Etling the starter heading into the season. He was judicious in giving Brennan a little on-the-job training in the first two games. He avoided an over-reaction to the blowout at Mississippi State by not throwing Brennan to the wolves. Now it’s time to give Brennan a more extended look in LSU’s final two non-conference games. Let him play more, give him a greater variety of challenges with the play-calling and see how he responds. The Tigers are one of three FBS teams not to have turned the ball over in 2017 along with Miami, which has only played one game, and Alabama. Orgeron has taken great pride in the fact that his team hasn’t turned the ball over in three games. Now’s a good time to see if the freshman can play extended minutes and maintain that level of ball security. See what kind of plays he can make when he’s faking a handoff to Derrius Guice, who has already pounded the opposing defense. See how he responds to a pass rush and see how he bounces back from a mistake. Maybe he’ll prove he’s not ready and that Etling still represents the better option with a visit to Florida looming Oct. 7. I just don’t think Etling is a natural QB. He does a ton of studying, but it doesn’t seem to do him much good. I see him as an average game manager at best. It would be quite the change for LSU if they could find and develop as actual play maker at the position. Having watched Brennan light it up on multiple Friday nights, I believe he can be that guy for LSU. The kid can play. This past Saturday night LSU played against a very inspired, intense and fired up bulldog team. The way that Mississippi State played I do not imagine any quarterback succeeding against their defense. The crowd was in the game and the officials seemed to be wearing blindfolds when watching the bulldogs but I have to agree they called everything possible against the tigers, some warranted and some not. Despite the penalties Coach Dan Mullen must be congratulated for defeating LSU with the access of much less talent. GO TIGERS!!!!!! Etling might be a good fit for an FCS school, but there’s no way he should be leading a power conference team. He is mediocre at best. Better to let the new recruit play and get some experience. This team isn’t good enough overall to do much this year anyway.